Everyone says you need to have a beautiful feed to reach your customers on Instagram? But what if you don’t know what to post? Have you ever felt like you could use an entire month’s worth of Instagram photo ideas? If some free photo prompts for Instagram sound like a good idea, keep reading. Real talk: Are you putting some thought into what you’re posting on Instagram? Or, are you flying by the seat of your pants? Let’s just say it — finding the right pictures to post on Instagram can be hard work. And if you’re used to posting on the fly, trying to come up with new photo ideas every day — Instagram can be downright exhausting! You open up the app, thinking “Oh man, it’s been awhile, I should probably post something.” You scroll through your photos, thinking, “Okay, I really need to set aside some time to take better pictures.” And then, feeling overwhelmed, “Ah, I have nothing to post!” You end up closing the app in frustration because you can’t think of anything interesting to share. If you’ve been there — I get it! 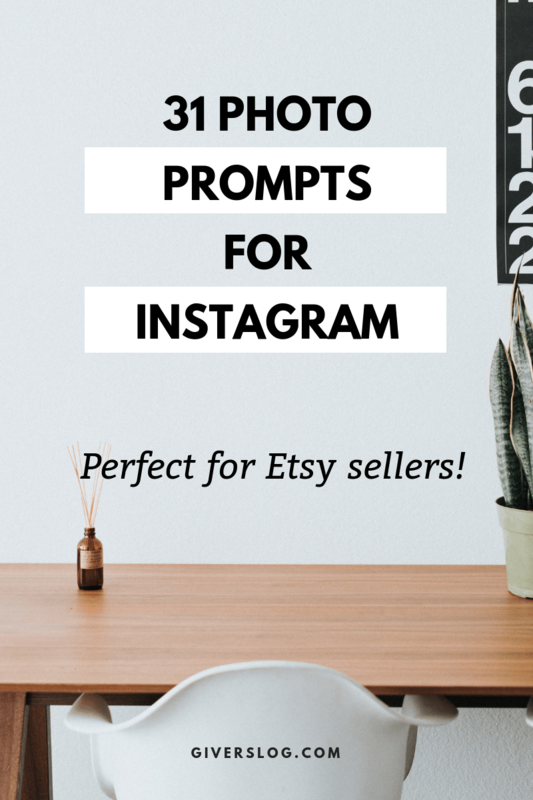 As a maker, an artist, or an Etsy seller, it can be so difficult to post about your shop without feeling like you’re spamming your audience with the same old product listings every darn day. But here’s the real deal — shops with large Instagram followings didn’t get there by accident. They planned ahead and took photos intentionally so they would have something interesting to share every day. And the truth is — you can do it too! Here’s a plan for an entire month of Instagram photo ideas. And the best part? You can rinse and repeat these ideas month after month after month. When you are reading over the photo prompts below, here’s what I want you to keep in mind: Don’t just follow the prompt for the sake of following the prompt. Instead, really think about how you can use the ideas in the prompt to post photos that connect with your followers and engage them in conversation. Engagement truly is the name of the game on Instagram. Remember to serve your audience, rather than sell them. When you create a post, focus on creating a connection. First, you want an audience to know you. Then, when they like you, they become your followers. And when they trust you? That’s when they become customers. show my audience more of my personality? share some interesting “behind the scenes” of my artistic process or my day-to-day business? build trust in my brand? entertain or inspire my followers? teach my audience something new, or answer their questions about my products? With these things in mind, keep reading to see the Instagram photo prompts. What does your studio look like? Take a wide shot of the whole space, a close up of your workbench, or another detail shot that shows the place where you create. Show off your beautiful branded labels, ribbons, etc. Let your followers experience the careful attention you give to every order. Show a favorite tool, where you got it, or what part it plays in your process. 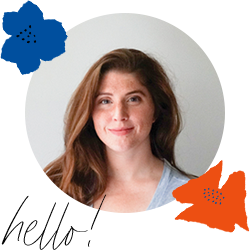 Share a headshot or a personal snapshot of yourself. Yep, it can be intimidating. But a photo of yourself is one of the best ways to engage your audience and create a human connection. Set up a tripod — or ask a friend — to capture a picture of your hands in the midst of making. For example, share a photo of the first handmade mug you purchased that inspired you to learn pottery. Or perhaps you can share a photo of you and your grandmother, if she was the person who taught you to knit. Share a photo of your business card, gift bags, or something else with your logo — and tell the story of how you came up with the name of your business. Share a photo of your favorite item to make. Tell what it is and why you love making it in your caption. What does it look like to get ready for a craft fair, farmers market, or design show? Show your packing process or your booth design. Create a styled photo of your open sketchbook that shows your design process for new products. This is a great way to tell the story of your products, from start to finish. Post a photo of one of your recent sold items — and in the caption, post a positive customer review. Good reviews can help shoppers feel more confident buying from your shop. Share the transformation of your items — from pure raw materials to finished product. A great way to do this is with a photo set. Your audience can swipe through to see the steps in your process. Answer questions that your customers often ask you. Illustrate the answer to this question in your photo. For example, can you think of a photo or video that will help customers know how to clean or maintain your item? Create a collection of images that have inspired your latest products. Maybe this is a picture of your physical cork board, or maybe it’s a digital collage you created in Photoshop or Canva. Looking for numbers 17-31? Click the box below to receive my free Instagram Photo Guide.